Colonies of Dysaphis lappae are attended by ants which tent the colony on the basal parts of Arctium spp. 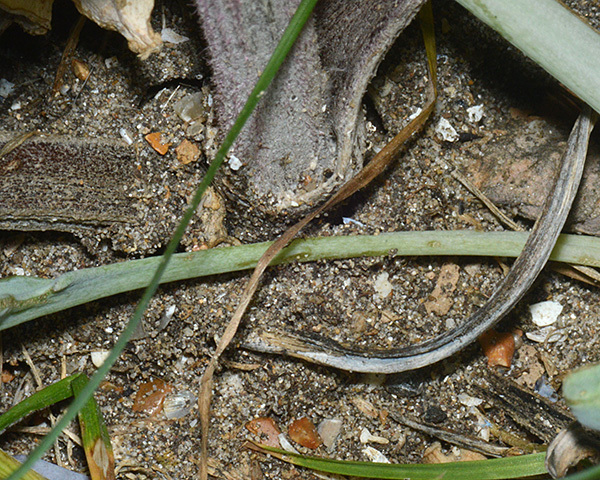 (burdock), in this case completely covering it with sand and plant fragments (see first picture below). Adult apterae of Dysaphis lappae are dirty olive greenish to brownish, sometimes with a purple tinge (see second picture below). Older adults may have yellowish margins to the abdomen. 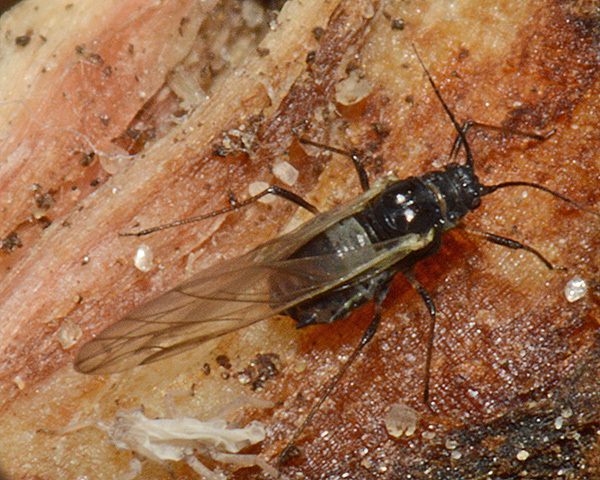 The rostrum reaches behind the hind coxae. 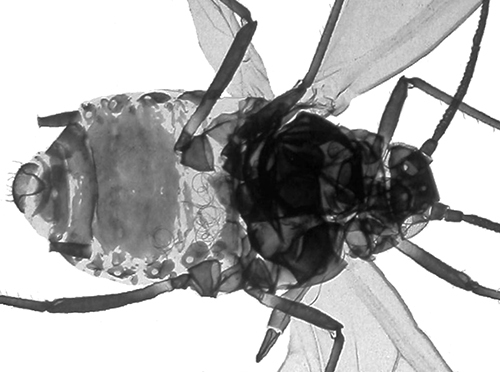 There are rather large marginal tubercles on the prothorax and abdominal segments I-V. The siphunculi are about 1.5-2.0 times the length of the cauda. 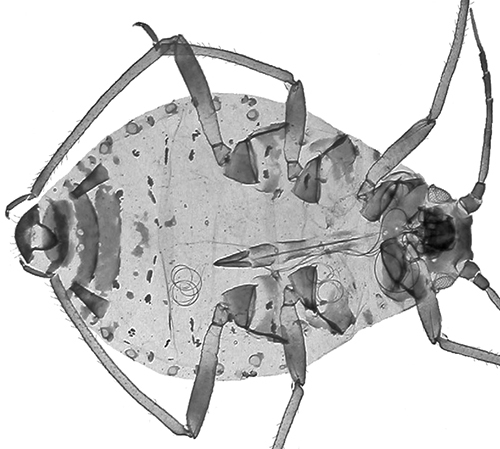 The body length of female adult apterous Dysaphis lappae is 1.7-2.5 mm. The alate is pinkish grey, slightly wax powdered with a rather extensive dark dorsal patch (see third picture above). The alate has 37-55 secondary rhinaria on the third antennal segment, 9-19 on the fourth segment and 0-1 on the fifth segment. 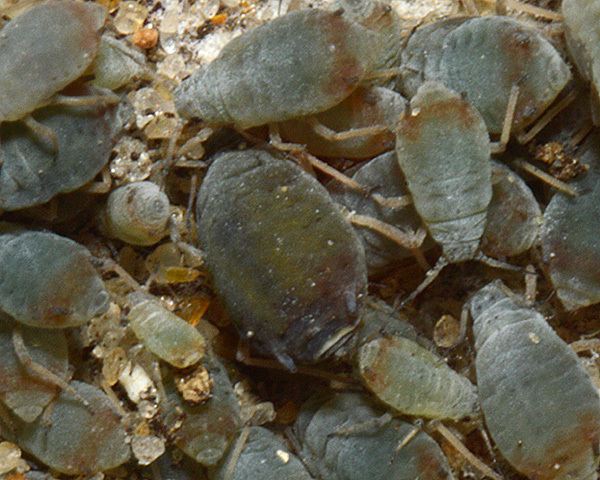 Dysaphis lappae nymphs are pinkish grey. 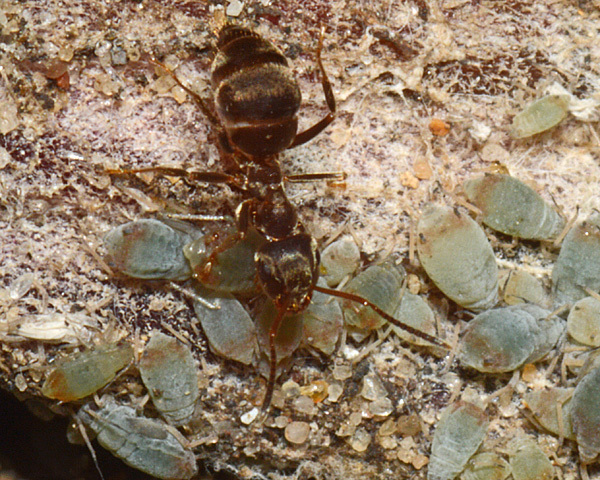 The clarified slide mounts below are of adult viviparous female Dysaphis lappae : wingless, and winged. Dysaphis lappae lappae feeding on Arctium species. Dysaphis lappae cirsii feeding on Cirsium arvense. Dysaphis lappae cynarae feeding on Cynara. The burdock mealy root aphid lives on the basal parts of stems, root collar and roots of burdock species (Arctium minus, Arctium lappa and Arctium tomentosum). Sexual forms are found in autumn. It is usually attended by ants. 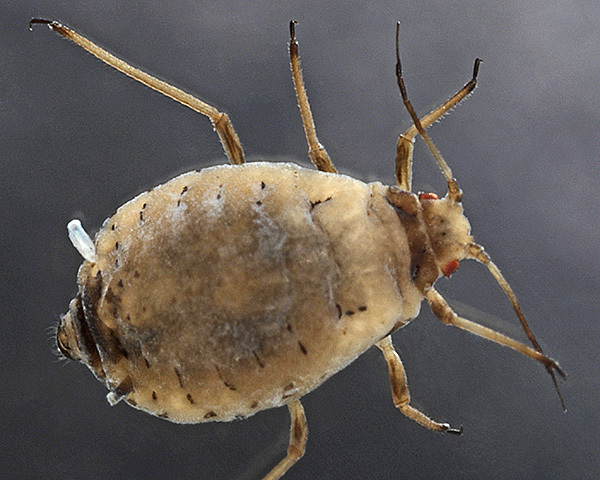 Dysaphis lappae is found in Britain, most of Europe, Transcaucasia, Central Asia, Western Siberia, parts of North Africa and introduced to Brazil. There is very little information available on the ecology of Dysaphis lappae lappae. Up to 2015, the only British records were those of Theobald (1927) (reported in Blackman (2010)), from Berkshire and Surrey in May. It has also been recorded in Ireland (Carter et al., 1987). Most of the records from other parts of Europe have been of the subspecies on Cirsium and Cynodon, although there have been several records of Dysaphis lappae lappae from Russia. Note especially the orange-red suffusion around and between the siphunculi. 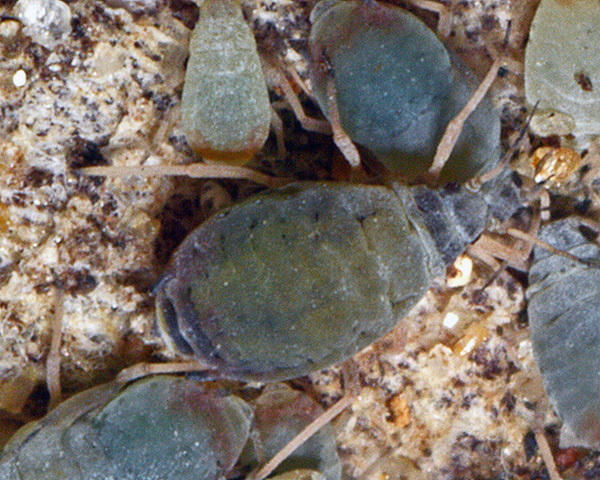 This is especially prominent on the nymphs, but is also present on the adults (see centre of picture below) as a purplish suffusion in the same area. The only mention of this localized colour patch in published descriptions of the species is reference to a 'purple tinge'. The colour is lost in alcohol preserved specimens. Both colonies were ant-attended, which may explain the rather sparse mealy wax covering on these aphids. Colonies were tented over with sand particles and vegetable matter. 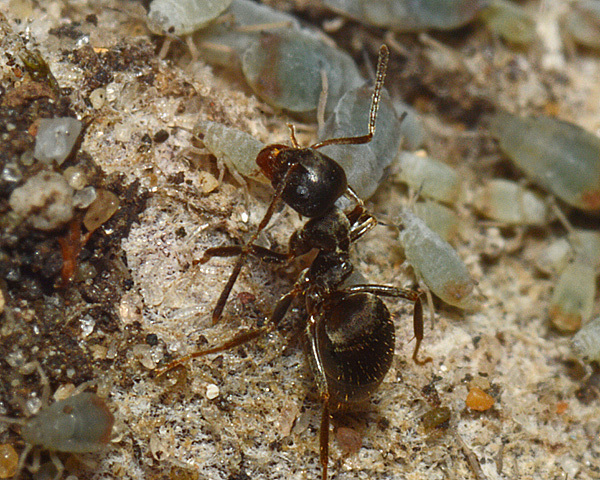 Once colonies were exposed, the ants departed making no attempt to protect the aphids. 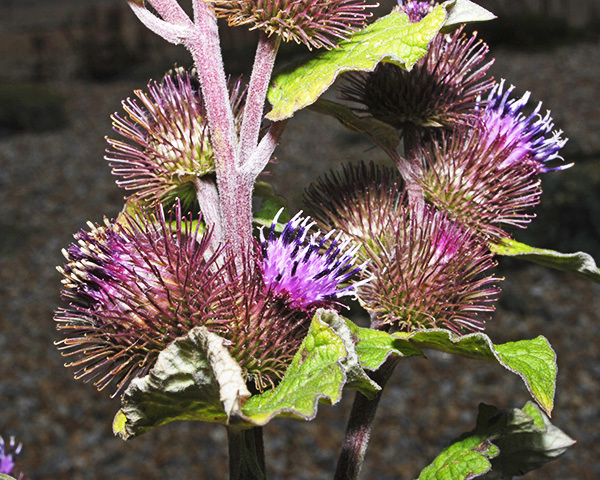 Dysaphis lappae lappae has been recorded from 3 Arctium species (Arctium minus, Arctium lappa, Arctium tomentosum). Blackman & Eastop list 27 species of aphid as feeding on burdocks (Arctium species) worldwide, and provide formal identification keys. 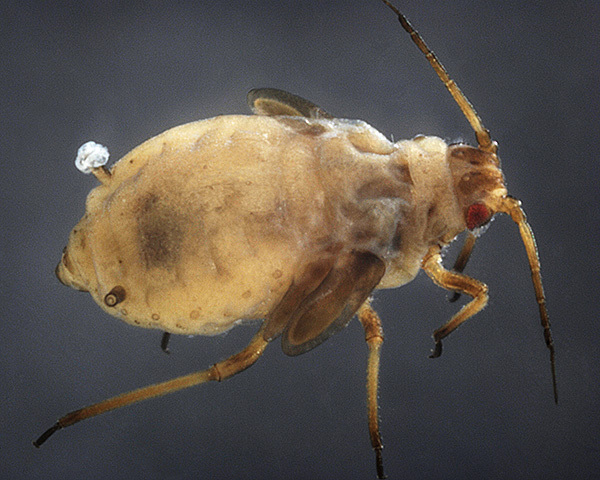 Of those aphid species, Baker (2015) lists 16 as occurring in Britain: Aphis fabae, Aphis fabae ssp. 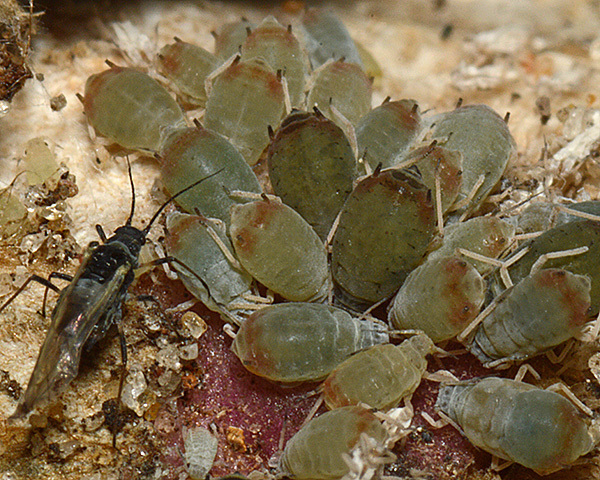 mordvilkoi, Aphis gossypii, Aphis nasturtii, Aphis solanella, Aulacorthum solani, Brachycaudus cardui, Brachycaudus helichrysi, Brachycaudus lateralis, Capitophorus elaeagni, Dysaphis lappae ssp. lappae, Macrosiphum euphorbiae, Myzus ornatus, Myzus persicae, Protrama radicis and Trama troglodytes.